Gourmet Girl Cooks: Low Carb Chili - "Chili Willy Chili" & the Best Low Carb Biscuits EVER! Low Carb Chili - "Chili Willy Chili" & the Best Low Carb Biscuits EVER! This evening I'm sharing the recipe again for my Low Carb "Chili Willy" Chili since Super Bowl weekend is upon us. It's a modified version of the chili that I used to make, except in this version, I've reduced the carbs by substituting diced zucchini and yellow squash in place of the beans as well as omitted using chili seasoning from a packet and instead put together my own equivalent. It is so easily adapted to your own tastes...you can make it spicy or mild, whatever your family likes best. This chili is great when served with my Cheddar Black Pepper Biscuits or my Buttermilk Biscuits. Of course there is always my Parmesan Biscuits, too. I've added links to the recipes for the biscuits above (just click on the name of the biscuit in red that you want to see the recipe for). If you are looking for a different chili recipe that uses chunks of beef instead of ground beef...I have another awesome recipe for my Sweet & Spicy Autumn Chili that can be done either in a crock pot or on the stove. 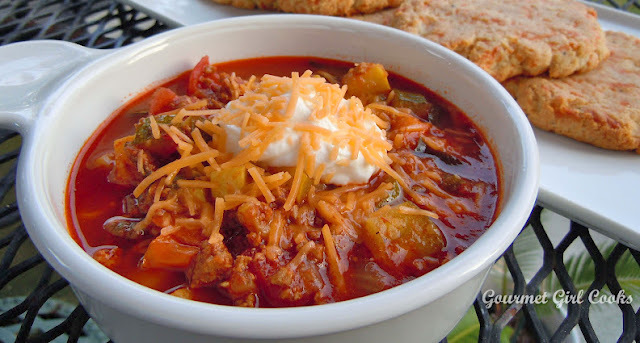 It's awesome, too (the recipe is linked above, simply click on the name of the chili in red). You can find the recipe for my Chili Willy Chili below. Enjoy! *Notes: Ground chuck and lean ground beef work great in this recipe too. If you don't like spicy chili, eliminate the jalapeno pepper...if you like it spicy, add more. If you want to use other types of peppers (yellow, orange, green, etc. ), substitute with your favorite. I like to use fire roasted tomatoes because they add more flavor...if you don't like anything "charred" in your food, use regular diced tomatoes instead. You can add more or less salt to make it perfect for your taste. The diced squash and zucchini are low carb substitutes for beans. If you eat beans, add 1 can of beans in place of (or in addition to) the squash and zucchini. One of the benefits of not using a "chili flavoring packet" is that you can fine tune the salt, chili powder, etc. to make it exactly the way you like it....not the way "McCormick" likes it. This recipe is easily adaptable to your own tastes. I hope you enjoy it!